Birthday party goody bags–my girls love them! This past Sunday, they were both invited to a party. Inside their treat bags, along with assorted chocolates, stickers and other fun surprises, was a set of jacks! Of course, Lily and Emmy had no idea what “jacks” are. It became my mission to teach them how to play as soon as we got home. First, we had to find a suitable playing surface. Not outside; the sidewalk is too rough and would scrape little hands. Not in the living room; the ball wouldn’t bounce on the carpet. Not in the the kitchen; the floor is too crummy and sticky. But in each of their bedrooms, they have hardwood floors–perfect! I scattered the jacks on the floor, like multicolored stars scattered across a shining amber sky. Sitting back on my heels, I tried to recall how I used to play. I showed Lily and Emmy how to bounce the ball, (let it bounce only once!) capture a jack and then catch the ball with the same hand. I told Lily to practice bouncing and catching the ball first, before trying to capture a jack and the ball. Then I started playing to see if I could catch each jack (the original onesies). SUCCESS! So I tried the next level–twosies–grabbing two jacks at a time. 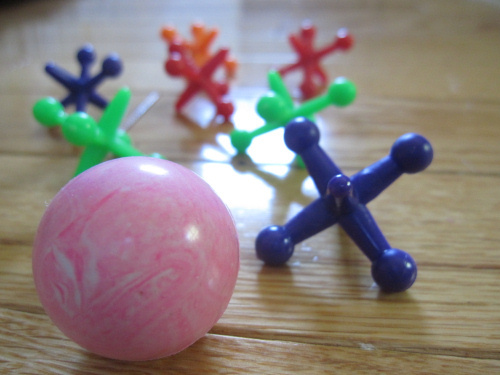 Those large plastic, multicolored jacks, perfect for little hands, were too big. The ball was too big. I couldn’t fit two jacks and the ball in my hand at the same time. Emmy deserted us after just a couple of minutes. Lily practiced bouncing the ball for a while, but soon they were both off playing somewhere else. At this age, Lily and Emmy would rather act out Tangled and take turns being Rapunzel and Mother. They are in a princess state-of-mind. One day, I think they’ll enjoy playing jacks together, just like my sister and I did. One day, maybe they’ll even let their ol’ mom join in for a game or two. Visit Alita Jewel’s Treasures for more Intentional Living through Simple Moments. What childhood game did you enjoy? What do you look forward to teaching your children? I loved this! My brother and I used to play jacks for hours. Ah, this reminds me of my summers at my grandmother's house! Of course she had all the "vintage" games a.k.a. didn't make noise and we ended up loving them! Your kids will too, it is just that being a princess comes first at this age! Plastic, really? I remember having the metal ones, too, but I suppose that's besides the point. I love watching my boys do things I used to love to do … it takes me back, makes me feel like I'm giving them little extra pieces of my life. Great BPM! Plastic jacks??? That just seems wrong! I suppose the smaller, metal ones may have been deemed unsafe somewhere along the way.Fun post…I really like your ending!